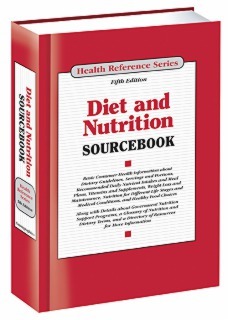 Diet and Nutrition Sourcebook, 5th Ed. Nutrition affects health, well-being, quality of life, and longevity, yet according to the 2015-2020 Dietary Guidelines (health.gov), about half of all American adults—117 million individuals—have one or more preventable diet-related chronic diseases many of which are related to poor quality eating patterns and physical inactivity. This, along with increasingly sedentary lifestyles and busy schedules, can lead to obesity, heart disease, certain cancers, and diabetes. The direct medical costs associated with these diet-related health problems are significant. The continued high rates of overweight and obesity and low levels of progress toward meeting Dietary Guideline recommendations highlight the need to improve dietary and physical activity education and behaviors across the U.S. population. Diet and Nutrition Sourcebook, Fifth Edition, provides up-to-date data on nutrition and health, including information from the recently updated Dietary Guidelines for Americans and facts about the new MyPlate food guidance system. It details how children, seniors, vegetarians, athletes, and others can benefit from good nutrition. It offers tips for smart grocery shopping, healthy food preparation, and the consumption of a varied, balanced, and nutritious diet. It also discusses strategies for maintaining healthy eating patterns in restaurants, fast food establishments, and other places where meals are consumed away from home. People with certain medical concerns will learn how dietary choices play a role in disease management practices, and a special section discusses the link between nutrition and weight loss and weight maintenance. The book concludes with a glossary, information about government nutrition programs, and a directory of related organizations. Part I: Guidelines for Healthy Food Consumption introduces basic concepts from the recently updated Dietary Guidelines for Americans and the new MyPlate food guidance system. It also discusses portions and serving sizes, food labeling information, and the healthy use of dietary supplements. Part II: The Elements of Good Nutrition presents details about basic food groups, fluids, vitamins, and minerals. Individual chapters describe the importance of protein, carbohydrates, fats, fruits and vegetables, dairy products, and grains. Other chapters explain why vitamins, minerals, phytochemicals, and antioxidants are important dietary components. Part III: Nutrition through the Life Span provides dietary information for people in different age groups. These include infants and toddlers, children, teens and college students, pregnant and menopausal women, and older persons. Part IV: Lifestyle and Nutrition presents nutrition statistics and explores ways for Americans to make healthy food choices when shopping for food, when cooking at home, or when eating out. It also provides information on vegetarian eating patterns, organic food choices, sports nutrition, and alcohol use. Part V: Nutrition-Related Health Concerns describes the most common dietary issues facing Americans, such as metabolic syndrome and other concerns about added sugars, food additives, excess sodium, and high-calorie beverage consumption. It also discusses the effects of nutrition misinformation. Part VI: Nutrition and Weight Control focuses on the health risks faced by those who are overweight, and a special chapter addresses weight concerns in children. Other chapters provide tips for healthy weight loss and evaluate popular diet plans, diet medications and supplements, and low-fat foods. Part VII: Nutrition for People with Other Medical Concerns discusses healthy eating patterns for people with diabetes, heart disease, lactose intolerance, food allergies, celiac disease, eating disorders, and cancer. It also describes the role nutrition plays in oral health. Part VIII: Additional Help and Information includes a glossary of nutrition terms and details about government-sponsored nutrition programs for people who lack access to affordable food, including programs for women and infants, school-aged children, and seniors. It concludes with a directory of sources for more information. “Health, food, and nutrition are all in the forefront of personal care and cultural trends in the twenty-first century. The sourcebook updates information such as the new food guidance system and often references the most recent dietary guidelines for Americans. Consumers will find topics that are useful to daily life such as “How to Use Nutrition Labels.” Entries focus on healthy and realistic ways to address food challenges through healthy weight loss. The discussion of contemporary food issues not seen in previous generations offers a cogent explanation of why consumers need to take control of food habits.